What are the lessons from business for Gordon Brown as he prepares to move from the role of the country's finance chief to chief executive, and are the qualities of a CFO the right ones for a future CEO? Andrew Kakabadse, professor of international management development at Cranfield School of Management, and Rob Goffee, professor of organisational behaviour at London Business School, discuss this in light of the devastating criticism of Gordon Brown from Lord Turnbull, who was head of the UK Civil Service until 2005. Lord Turnbill said in an interview with the Financial Times that there had been an "absolute ruthlessness with which Gordon has played the denial of information as an instrument of power". He said Brown "has a very cynical view of mankind and of his colleagues. He cannot allow them any serious discussion about priorities". Lord Turnbill also claimed Brown told government colleagues what he was going to give them three days before a budget. "This was at the expense of government cohesion and any assessment of strategy... You cannot help admire the sheer Stalinist ruthlessness of it all," he said. Kakabadse said: "Firstly we don't know how true the statement is. The second thing is that, if it is true, and I suspect it is, there is a hell of a difference between running the Treasury and being Prime Minister. "Lord Turnbill described him as ruthless, but what he was actually being was disciplined and focused. Running the Treasury is like being director of finance in a company. The Treasury guidelines have not changed since the days of Harold Wilson in the last century…. They require a high degree of discipline from the Chancellor of the Exchequer. "On top of that you have a heavy government programme and the New Labour disciplined approach and it is easy to see why it might be seen as ruthless. Actually what they are is disciplined. Most of the previous incumbents in that role have been accused of being ruthless - Denis Healey comes to mind. The question is whether we are really talking about Gordon Brown or the role of chancellor. Of course, whether you are focused nicely or nastily is another question." Goffee says that the criticism of Brown is coming from particular sources - and some people vigorously contest them. "But if, for the sake of argument, you were to accept them, what might you do? The apparently easy answer is to go from exclusive to inclusive, ruthless to consultative and cynical to positive (about others). In doing so, however, you risk the accusation of not being 'true' - of spin, chameleon-like changes, etc. "Perhaps the solution lies in shifting the 'ruthless' perception to 'tough', 'gets things done', offers 'strong leadership'...this might add up to 'being yourself more with skill' in our terms." Anyone moving to Number 10 Downing Street would have a very tough transition to make to take on this very different role, said Kakabadse: "Saying he is Stalinist is a different thing, it is the Red Herring in all of this. That said, if he is to become prime minister there will be a hell of a shift; it's a wholly different role, rather like being a CEO and chairman of a company combined. To be prime minister requires a whole variety of skills and styles. He will need to listen to a range of stakeholders, he will be dealing with the press and media, trying to spot someone taking a different view and dealing with it sensitively. He will need a far more collegiate and collective approach. 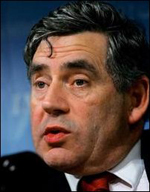 Whether Gordon Brown has that is doubtful. Experience and history would say he can't make it." Professor Goffee says Brown's challenge is to build new relationships in a new context. "This involves a delicate balance between retaining real personal differences and qualities and adjusting to new realities. Too much sudden change and you look untrustworthy; too little change and you look stubborn and inflexible. "In our book 'Why should anyone be led by you?' we advise that leadership rests upon authenticity and urge individuals to 'be themselves - more - with skill'. It's clearly more complicated that 'being yourself' because, crucially, what leaders must do is adapt to different contexts and understand that leadership is a relationship. These two assumptions are backed by decades of research - and common sense!" Kakabadse says the history of business offers little ground for optimism. He says: "Not many people have made the transition from the head of finance to the role of CEO and chair of the company and in politics you have to make the change much more quickly than in business." "The evidence from business is that the transition from CFO to CEO is not usually a successful one. From the research on leadership transition in business the average time to make the change, in focus and style, is 20 to 25 months - leaving room for mistakes, shifting the mindset, acknowledging errors and getting to know the job. Gordon Brown will literally have seven hours - one day he will be chancellor, the next prime minister. There is no chance to adjust his style and he is moving into the job without an election so there is no feedback from the electorate and no chance to find out how people feel about him." In business it is not uncommon practice for an outgoing CEO to stay in the post as a sort of mentor for around six months, said Kakabadse. "It does not always work but overall it is helpful. It's not going to happen with Tony Blair and Gordon Brown. "Also we have to bear in mind that the relationship between Brown and Blair has not always been great. Add to that that he has been chancellor for 10 years and has not had any other role. Anyone in business would be stupid to make that transition and any selection committee would be even dumber to recommend it."